Tesla is on track to do something few car companies have ever done: grow 50% a year for the foreseeable future. But it needs to get its production levels straight. Updated from 9:24 a.m. to include thoughts from Deutsche Bank analyst in the thirteenth paragraph. NEW YORK (TheStreet) -- Tesla Motors (TSLA - Get Report) is on track to do something few car companies have ever done: grow 50% a year for the foreseeable future. But it needs to get its production levels straight, first. CEO Elon Musk said the company is poised to grow 50% in 2015, at least 50% in 2016 and for the foreseeable future, something that's almost unheard of. "We're growing our production by like 50% a year, year-over-year as far into the future as we can reasonably project," Musk said on the third quarter earnings call. "That's quite a big percentage growth for manufacturing a large, complex object. We would like to grow faster of course, but it's also worth bearing in mind we have got one factory." Tesla continues to be supply constrained, though, for a different reason than in the past. For the full year, Tesla said it expects deliveries to be around 33,000 units, down from around its previous estimate of 35,000, due to "the complexity of launches related to dual motor and autopilot hardware. Consequently, we expect to deliver approximately 33,000 vehicles for 2014." Previously, Tesla had blamed the lack of lithium-ion cells for battery packs as a reason for not being able to fulfill demand. The company did note that previous projections (of which it expects to have an annual run rate of 100,000 cars by the end of the year) for 2015 are unaffected. It delivered 7,785 Model S units during the quarter, earning an adjusted 2 cents a share on $932 million in revenue. Analysts surveyed by Thomson Reuters expected the company to lose an adjusted 1 cent a share on $889.28 million in revenue. For the fourth quarter, Palo Alto, Calif.-based Tesla said it expects to earn an adjusted 30 to 35 cents a share. Musk harped on the issue that it's difficult to make hundreds and thousands of a product as complex as the Model S, given issues may crop up in one in 100 cars, but all 100 have to be checked. "We also learned a lesson in manufacturing that you have issues that are sometimes one out of 100, but unless you make 100 of something, you don't see it," Musk said on the call. "Then you think the car is all good, but actually randomly one out of 100 is wrong, but you don't know necessarily which one out of the 100, then you've got to go look at all 100 cars." Dougherty & Markets research analyst Andrea James believes the issues Tesla has faced are likely to help investors move on. "Tesla used the quarter to clear up a lot of noise around Q3 production and Q4 deliveries, and worries about Model X delays," James said in an email. "Now, we can move on." 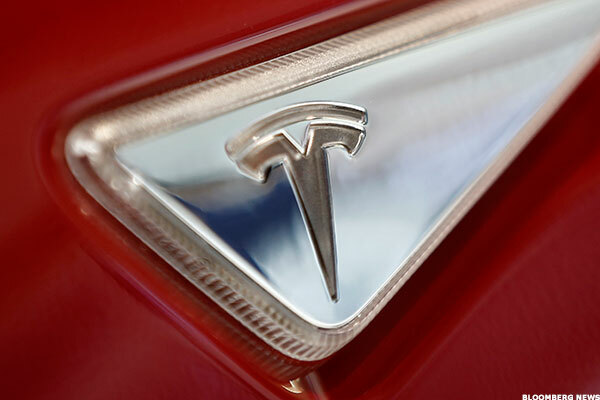 JPMorgan analyst Ryan Brinkman, who rates Tesla "neutral" with a $190 price target, believes that the three issues that emerged during the quarter -- third-quarter production challenges, fourth-quarter production challenges and production development and validation challenges -- will set a higher wall for Tesla to climb, relative to expectations. "At a minimum, however, we believe one proper takeaway from 3Q results is this company has its work cut out for it to achieve the ambitious goals it set for itself, let alone very high investor expectations," Brinkman wrote in a note. Shares of Tesla were higher in early trading Thursday, gaining 5.8% to $244.38. Tesla also stated that the Model X would be pushed back to the third quarter of 2015, as it works to get Alpha and Beta prototypes and testing complete. Deutsche Banka analyst Rod Lache noted that was likely the case, given "(this was largely known as customers' order confirmation emails have been indicating a Fall 2015 launch)." "We recently decided to build in significantly more validation testing time to achieve the best Model X possible," Musk wrote in a shareholder letter. "This will also allow for a more rapid production ramp compared to Model S in 2012. In anticipation of this effort, we now expect Model X deliveries to start in Q3 of 2015, a few months later than previously expected. This also is a legitimate criticism of Tesla- we prefer to forgo revenue, rather than bring a product to market that does not delight customers. Doing so negatively affects the short term, but positively affects the long term. There are many other companies that do not follow this philosophy that may be a more attractive home for investor capital. Tesla is not going to change." However, Musk as well as Chief Financial Officer Deepak Ahujha and Chief Technical Officer JB Straubel are confident that the issues are behind Tesla, as the company said is estimating toward a weekly run-rate of 2,000 cars, and production of 50,000 Model S units next year should be an exceptionally easy goal to achieve, according to Musk. "We feel very confident with 50,000 Model S vehicles a year," Musk said on the call. "It's probably more than that, but that's the number we're confident in. There are other macro-economic factors that play into it, so difficult to be for certain, but 50,000 is a number we're pretty confident even if economies aren't great in certain parts of the world." With the supply chain issue still at the forefront of investors' minds, Credit Suisse analyst Dan Galves believes expectations for 2015 volume has been reset, as the company continues to open the floodgates for the Model S, moving further into China, the unveiling of the dual motor version of the Model S, as well as the Model X. "Much of the challenges were well-flagged by the market and we believe the Street can now re-focus on the longer-term, which we still see as very bright," Galves wrote in a note. Musk said repeatedly that demand is not an issue, and Galves said the company has more levers that it can pull to increase demand that it isn't pulling because infrastructure, such as service centers, Superchargers and stores have not been fully built out, leaving the company's future prospects exceptionally bright. "We see Tesla as having sustainable competitive advantage in an industry where that is very rare, which will lead to very higher demand." Tesla's long-term prospects are bright -- it just needs to get its supply chain working at the level it wants.